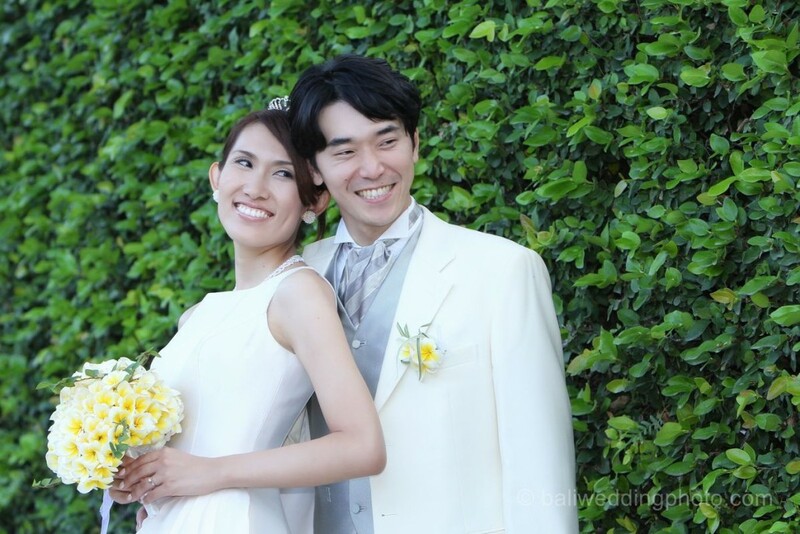 Our wedding couple this time come from Japan, their name is Hiroko and Hiroyoshi, they are lovely couple to work with. The wedding venue is at Amanusa hotel Bali and it is a sunny day for beach wedding in Bali. As usual once we arrive at the hotel, we go straight to the bride preparation room and meet up with Hiroko, the bride. 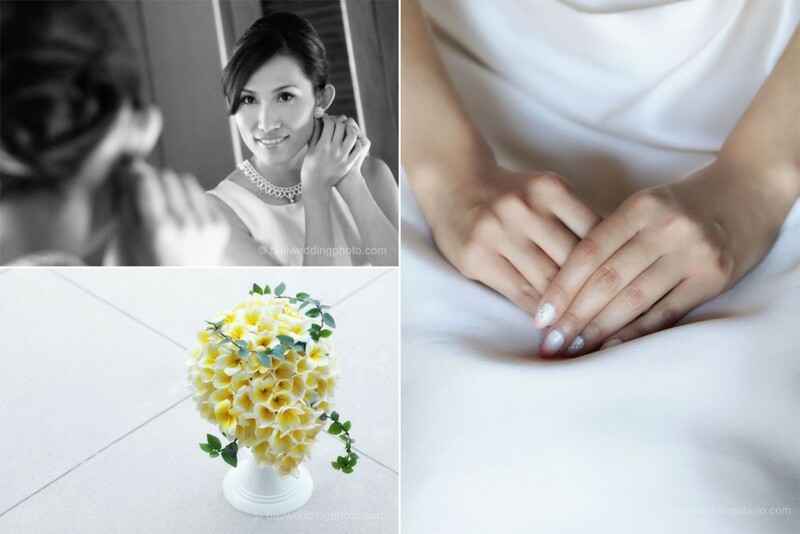 We take some wedding details photo of the wedding bouquet, wedding ring, bride makeup photo, and wedding venue setup. The weather is a little bit hot, and the summer breeze makes feel fine. Bride walking down the aisle with two flower girls leading the way to the wedding venue, the groom waiting for his bride and prepare to welcome his beautiful bride. The wedding ceremony is little bit unique, because no priest or celebrant at the wedding venue. Bride and groom exchange vows, groom put on ring on bride’s ring finger, then bride put on corsage for groom and the wedding ceremony ends. 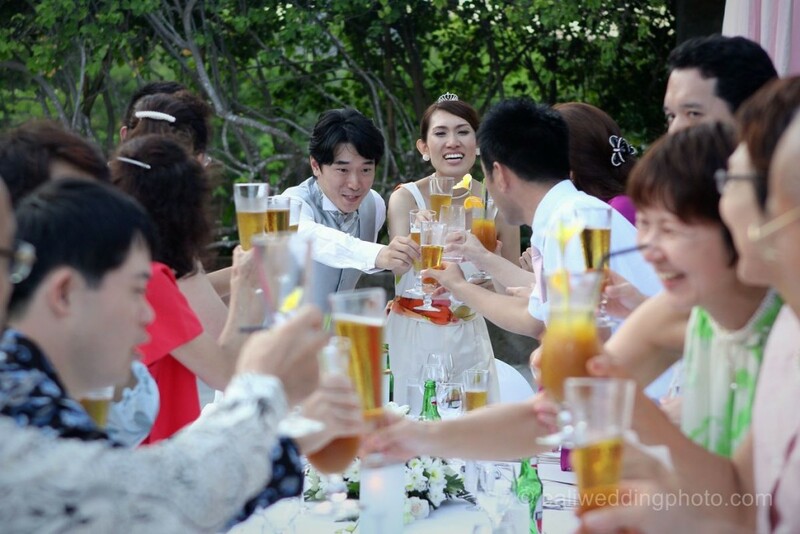 It is a really simple but meaningful and intimate weddings, the pace is little bit fast than the other wedding we usually do, so we have to be really focus to get every moment of this wedding to make sure we don’t miss any moment of the wedding ceremony. We are glad that we are successful capturing all moments from A to Z of the wedding ceremony. The beautiful beach view in the background with the blue sky make everyone happy just by seeing it. After Flower shower, we continue with photo tour on the beach and some photos around the hotel area before the wedding reception starts. It is a really sunny day with beautiful blue sky and white sand at Nusa Dua beach. The Amanusa hotel area also has some nice locations for wedding photoshoot. The wedding reception starts at 6 PM, bride and groom walk in. Wedding reception table is set next to the pool, it is a really nice and simple setup for a small wedding reception. Speech from one of the guest opens the wedding reception, followed by cake cutting ceremony by bride and groom, a simple beautiful wedding cake. 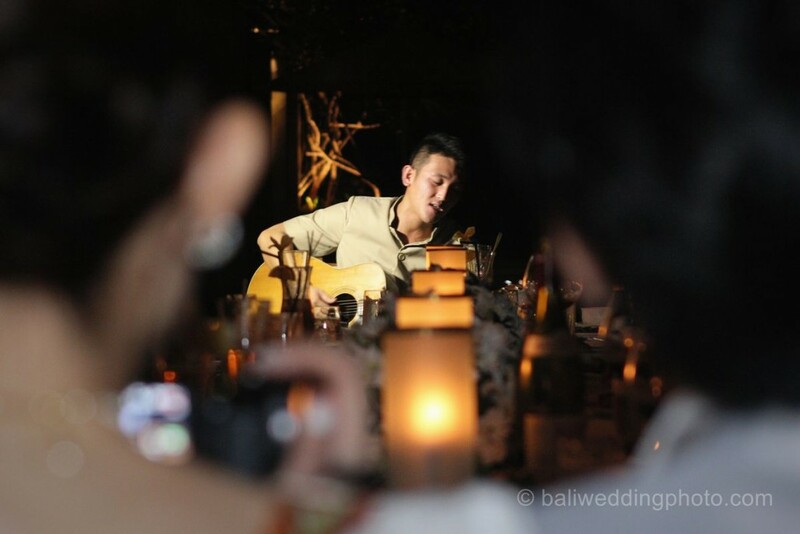 The wedding reception continues with the wedding toast and a song from groom’s brother for our newly wedded couple. Our photoshoot session ends along with the end of the song. 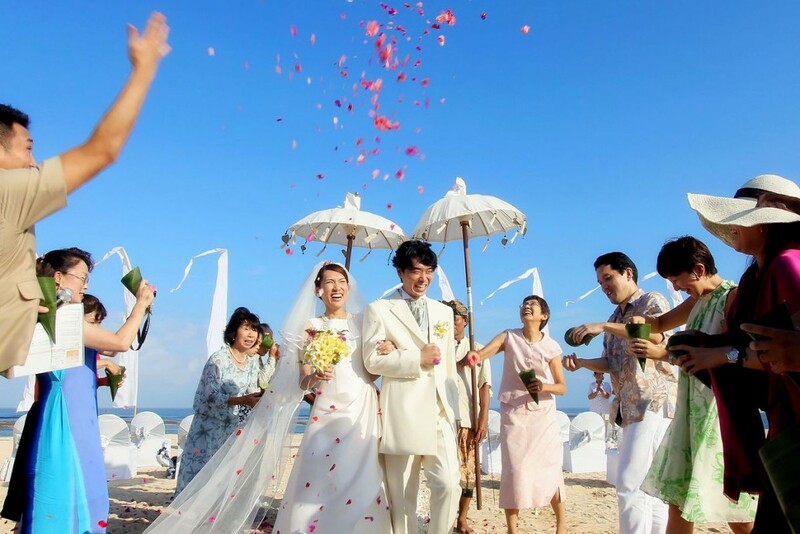 It is a lovely beach wedding and wedding reception of our friendly and humble Japanese newly wedded couple at Amanusa Hotel Bali. 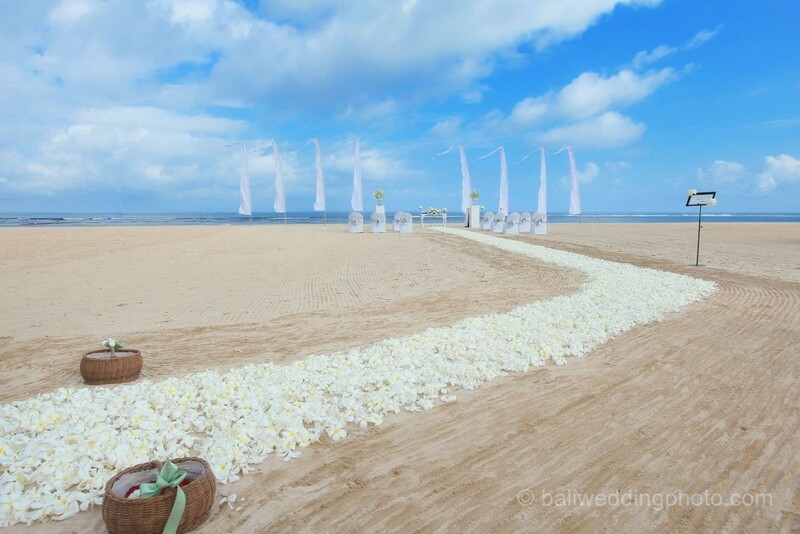 Do you plan to have a beach wedding in Bali?